Twenty months on from the start of the Trump administration the President’s combative trade policy is delivering real world consequences for supply chains. The President’s fundamental approach to trade policy is driven by the concept that a trade deficit, particularly in merchandise, represents a loss by America in favor of its trade counterparties. 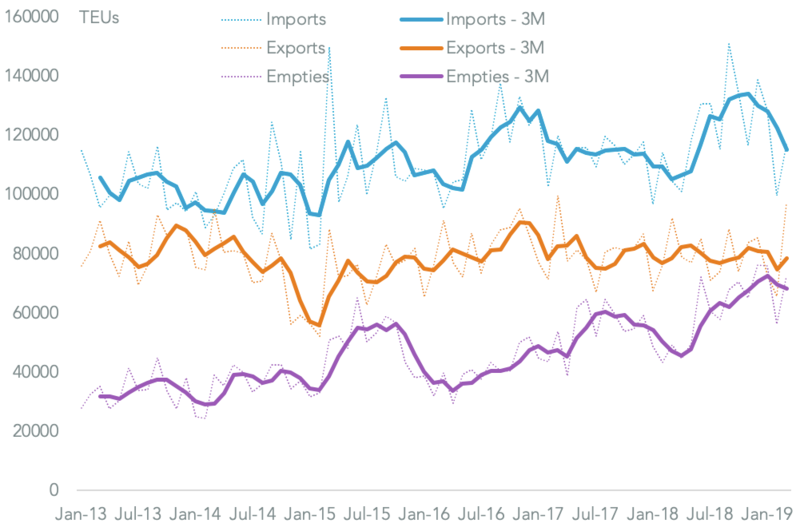 On a trailing 12 month basis the U.S. trade-in-goods deficit reached $823 billion in June 2018, the highest since September 2008 and 11.8% above December 2016, Panjiva data for U.S. exports and imports shows. That’s led by China ($390.2 billion), the EU ($159.1 billion) and NAFTA ($87.6 billion). A big part of the rise in the deficit has been an increase in imports. That has continued into July 2018, with a 6.0% increase in seaborne shipments on a year earlier as outlined in Panjiva research of August 13, in part due to concerns among importers about the widening range of duties applied and planned by the administration. So far the Trump administration has deployed three major pieces of trade legislation to try and limit imports. Section 201 “safeguarding” reviews were used in relation to the washing machine and solar power generating sectors to tackle an extended period of “country hopping” by manufacturers that had limited the effective of more traditional AD/CV cases. 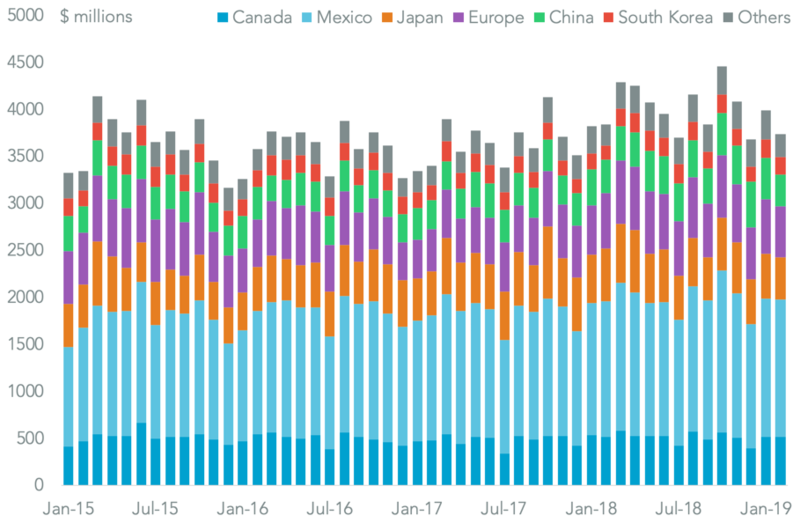 The two cases covered $7.1 billion of imports in 2017, Panjiva data for washer and solar power imports shows. National security type reviews (section 232) have been implemented in relation to steel and aluminum ($46.1 billion of imports) and are underway for both the automotive ($290 billion including both cars and parts) and uranium products ($2.8 billion) sectors. Just as important as those though is the section 301 intellectual property rights investigation of China. That has already resulted in 25% duties being applied to $34 billion of imports from July 6 and $16 billion from August 23 with a further $200 billion under review – i.e. $250 billion on total. 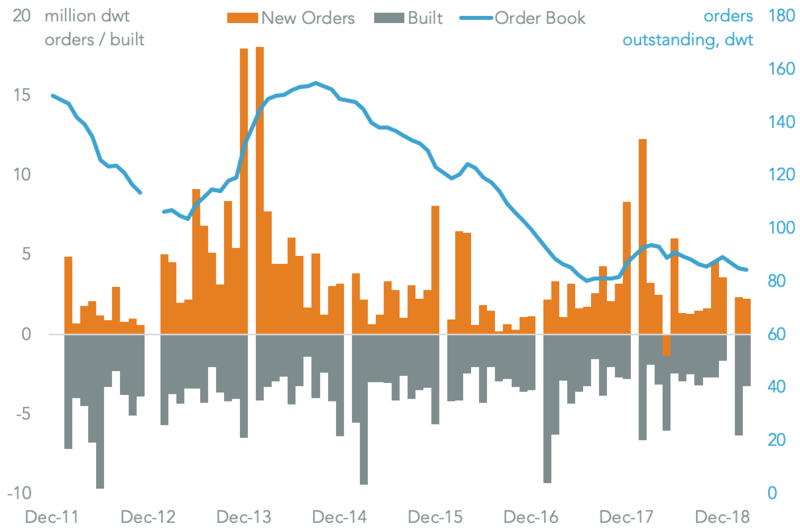 Imports of steel and aluminum have fallen following the imposition of section 232 duties – by 22.4% in July vs. March Panjiva data shows – the drop has not been precipitous. Indeed imports in the three months to July 31 were only 7.6% lower than in the first quarter in dollar terms. That’s not to say that the impact of duties can’t be more significant. 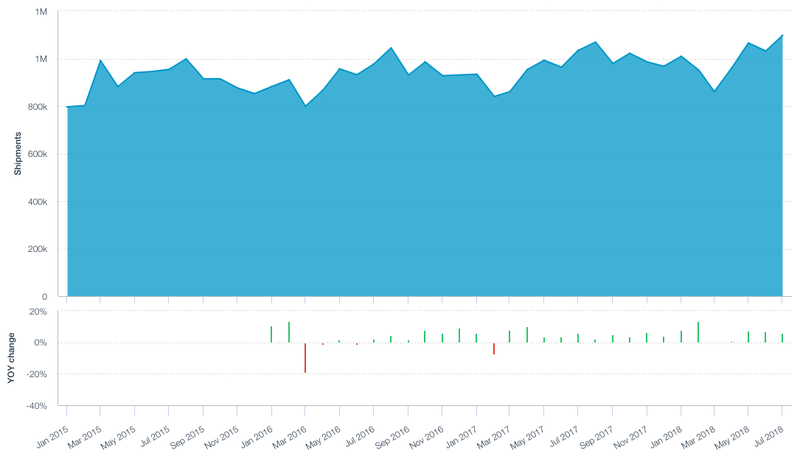 Seaborne imports of solar panels and washing machines in the three months to July 31 were 70.6% and 58.8% below their three month peaks of November and December respectively. 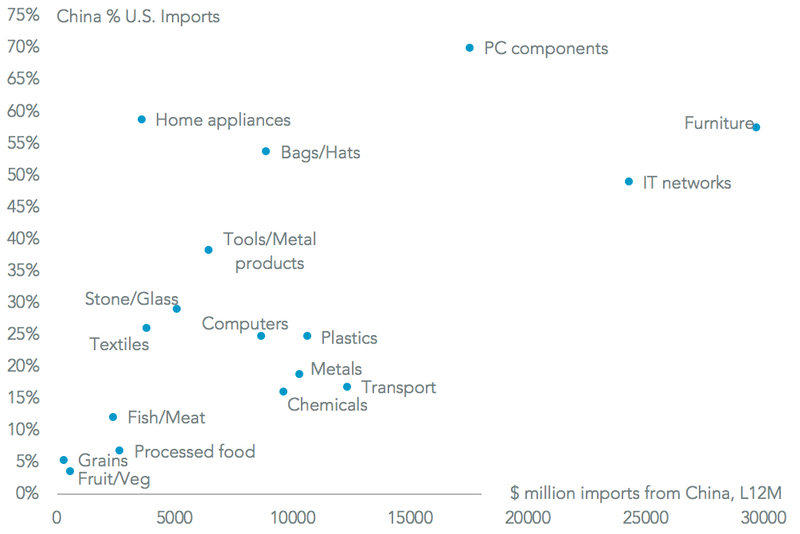 The initial round of $36 billion of Chinese exports products targeted for duties under the section 301 review were focused on industrial products, Panjiva analysis shows, on industrial components such as PC components ($1.39 billion), fuel pumps ($869 million), and construction equipment parts ($788 million). The automotive sector more broadly (HS-87) is also targeted with $1.56 billion of products becoming subject to duties. 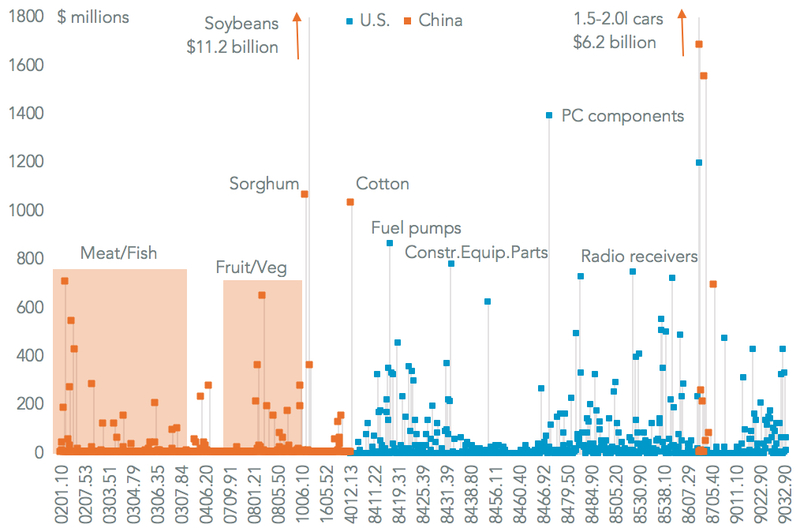 China retaliated immediately with cars are also a target for China after the administration of President Xi selected $9.99 billion of products on the phase one list as well as soybeans (worth $11.3 billion) and a wide range of meat and fish ($3.77 billion) as well as fruit and vegetables ($2.16 billion). 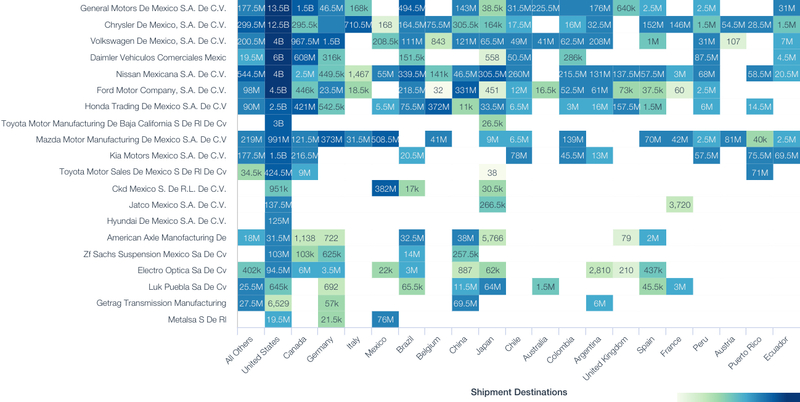 By the end of the year a further $200 billion of Chinese exports and $60 billion of U.S. exports could be targeted by 25% duties across a wide range of products including China’s exports of IT network equipment and American shipments of commodities. One challenge for both parties lies in managing the economic impact of duties. In many instances there are few other providers in scale of the products covered by duties. As a result out of nearly 200 companies commenting on duties in the most recent conference call season 47% stated they will raise prices for consumers while just one quarter will start to retool their supply chains. 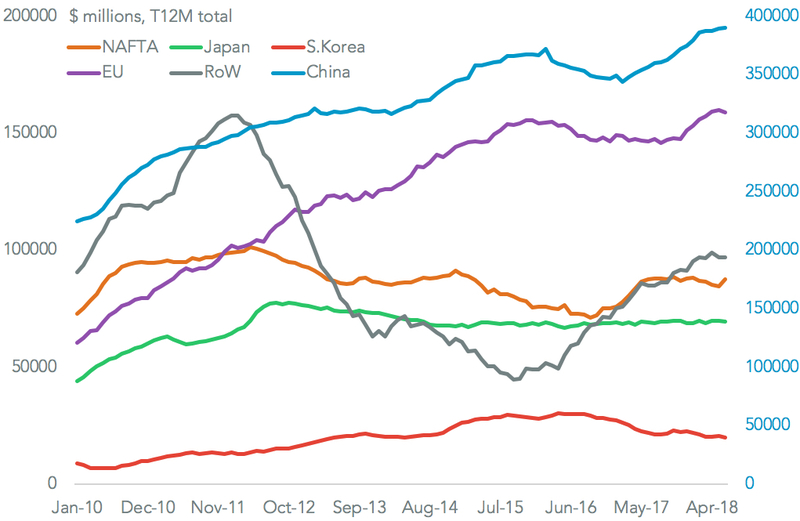 The impact on the American economy of the section 232 review of the automotive industry combined with NAFTA negotiations could prove to be nearly as significant with $290 billion of imports in the cross-hairs vs. $250 billion in the case of China. 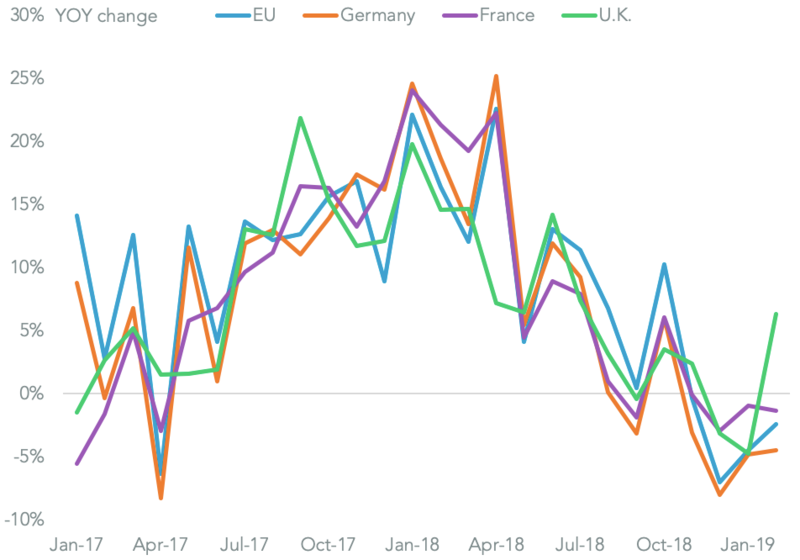 Yet, automakers appear unworried so far with exports of completed vehicles up by just 1% in July vs. a year earlier likely reflecting lackluster sales in America. As was the case with the section 232 review of metals the impact of exemptions will matter as much as tariff rates or product coverage. A completion of NAFTA negotiations should reduce the overall risk for U.S. automakers including General Motors (81.6% of its Mexican exports went to the U.S. in the past 12 months) and Fiat Chrysler (86.6%). A temporary exemption for the European automakers is also possible after the recent rapprochement reached between President Juncker and President Trump. The process of exemptions is a further complication for assessing the supply chain impacts of the Trump administration’s trade policies in the coming months. Other issues include: bilateral trade discussions such as those being held with Japan; sanctions, including the extension of section 232 duties, as being faced by Turkey, Russia and others; a review of foundational tariff concepts such as the Generalized System of Preferences exemptions for India, Indonesia and Thailand; and uncertainty about America’s participation in the World Trade Organization. Finally the unintended consequences of an extensive tariff policy could lead the administration to consider ever-wider tariff applications. Economic orthodoxy, illustrated by a recent Federal Reserve paper, shows how tariffs – even without retaliation – can result in reduced exports and an unchanged tariff deficit. Corporate reactions while initially focused on price rises will inevitably turn to sourcing strategies. Without resorting to evasive measures simple avoidance can include shifting final assembly of products, or “knock-downs” to other countries. That process has been seen vividly in Samsung Electronics’ exports of washing machines to the U.S. from South Korea, then China, then Thailand and Vietnam with the final result of the section 201 review referred to above.